Vice President Mike Pence said from the sidelines of the Association of Southeast Asian Nations (ASEAN) summit on Thursday that President Donald Trump will hold a second meeting with North Korean dictator Kim Jong-un next year. Pence said the United States expects Kim to submit a firm denuclearization plan at the meeting. “Everything begins with relationships, but now we need to see results,” Pence said in an interview with NBC News in Singapore on Thursday. Pence stressed the progress made with North Korea so far: “No more missiles being fired, no more nuclear tests and our hostages have come home.” He added that he was honored to be at the ceremony in Hawaii when American troops received Korean War remains from North Korea. “The mistakes of the past can easily be described as one administration after another, in both political parties, with regard to North Korea where promises were made for denuclearization, relief was given to North Korea, then promises were broken,” he said. NBC’s headline for the interview was “Second Trump-Kim Summit to Go Ahead Without List of Nuclear North Korean Weapons,” but the vice president did not actually say that. On the contrary, he made several references to complete and verifiable denuclearization, a goal that could not be achieved without a complete inventory of North Korea’s existing weapons. “I think it will be absolutely imperative in this next summit that we come away with a plan for identifying all of the weapons in question, identifying all the development sites, allowing for inspections of the sites and the plan for dismantling nuclear weapons,” Pence replied. 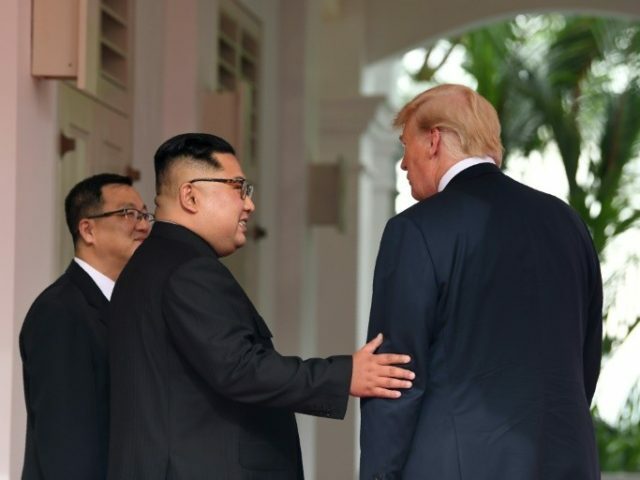 He added that Kim Jong-un also expressed “gratitude” for Trump’s role in the process during conversations between the North and South Korean leaders. “If the second North-U.S. summit is realized, I expect there will be significant progress for the peace process and the complete denuclearization of the Korean Peninsula,” Moon predicted. Moon also expressed appreciation for Vice President Pence’s attendance at ASEAN, noting that Pence has “a deep connection with Korea just like his father.” The vice president’s late father Edward Pence, Jr. was awarded the Bronze Star for his service in the Korean War. Reuters and AFP on Thursday anticipated the Trump administration will have trouble maintaining the maximum sanctions Pence recommended because China and Russia have already “eased” pressure, while South Korea is “mulling lifting its own measures against Pyongyang.” President Moon’s administration frequently denies that it plans to lift sanctions against North Korea without international approval.